Cats have this habit of kneading at anything soft, moving one paw after the other rhythmically. Cat parents watch kitty while she is doing this and wonder why do cats knead. Some cats will knead with the front paw while others will use the back paws as well. The kneading movements will vary slightly from cat to cat, with some cats bringing their claws out when kneading and others keeping the claws safely tucked inside their paws. Also known as ‘making bread’ or even ‘ making biscuits’ this fascinating cat behavior starts very early in life when a cat is newly born. Kittens are known to knead their mothers frequently. Naturally, it helps to stimulate the mother to produce more milk for the kittens. The kittens learn this and make it a regular behavior which they associate with reward or good feeling. Pet experts believe that it’s this association of kneading with good things that makes kittens carry the habit right into adulthood. An adult cat will knead, even though it isn’t suckling. But why do cats knead? There are several reasons for this and your cat is not going to stop doing it anytime soon. It’s a harmless habit though, so it should not cause you worry-not unless your cat overdoes it, and which is unlikely. I find kneading fascinating, especially when my cat paws at my lap. It’s an affectionate thing when the cat does it on your lap or leg, plus, I love the way the cat looks comfortable and safe while doing it. Cats knead for the following reasons, according to experts on pet behavior. When your cat kneads, it’s most probably content with life in your house. It means nothing is bothering its life, be it rival cats, or uncomfortable living conditions. Kneading is hard-wired in its brain to come out when things are good, and there’s comfort. It explains why some cats will even drool when kneading, fully absorbed. During kneading the cat will often get into a trance-like state, which shows how calm and relaxed they are. So, you will find your cat kneading when it’s full and in good health. Showing affection is one of the reasons why do cats knead. Cats are very loving creatures. They recognize their owner and often become playful when around them. So, the cat is simply telling you how it loves you by kneading at you. It’s one way of communicating its love for you using its paw. Sometimes the cat will purr while kneading, maybe to attract your attention or as a sign of intense affection. The best thing to do at this time is to love back by allowing it to knead you or providing a soft surface on which to knead such as a blanket or a pillow. When your cat has gone through a stressful situation, it may turn to kneading to calm itself. It’s one way of relieving stress, just like we, humans, have activities that we engage in to relieve stress. It’s the reason why you should allow your pet cat to go on with their kneading, even if it’s happening on your body- but that’s if it isn’t hurting, like when the claws are not out. You would be helping your cat to become happy once again. Marking their territory is another reason why do cats knead. Cats sweat at the paws, producing a scent they can trace. Most of the time, when it’s kneading, it’s probably introducing this unique scent to mark its way or residence. Being its owner, your cat will also knead you to ‘mark’ you as familiar and be belonging to them. The cat will mark entrances and the seats in your home, or even the bedding. It uses the scent in its paws to mark anything, a behavior that’s common with felines. Your cat may not know it, but it’s doing what it’s naturally inclined to. You will notice your cat kneading frequently when it’s about to go in heat. It’s a natural thing with them, and one that every cat will do. A female cat does it to go in heat while a male cat’s aggressiveness increases after kneading just when it’s about to mate. Whenever you notice an increased or compulsive need to knead in your cat, check to see if it’s caused by the need to mate. To avoid this situation, get your cats spayed or neutered. Kneading is an exercise like any other. If your cat has been inactive for long, it will knead to stretch its paws and the whole body. The movements help it to straighten stiff joints and muscles to prepare for the activity, such as moving around the house. Most cats knead just before a nap. The calming effect of kneading helps it to go into sleep quickly. It’s a learned behavior that turns out to be an activity that precedes napping, and it happens automatically, without the cat having to think about it. Not every cat will knead before a nap, though, and your pet cat not doing it doesn’t make it abnormal in any way. Evolutionary behavior is a further reason why do cats knead. Scientists attribute the natural act of kneading to when the cats were in the wild, long before domestication. The wildcats would use the paws to carefully arrange and ‘knead’ leaves and grass to make a nesting place. It’s believed that this is the behavior that cats have carried on up to this day. Although domestic cats do not need to make nesting places anymore, the act is still natural to them. Now cats still knead, but for different reasons. In its early life, your cat learned to knead by performing it on the body of its mother. Because the body it pawed was smooth and soft, it will likely find similar surfaces to paw at. It explains why cats knead pillows and blankets. They will also paw at any fabric that’s furry or fluffy, such as laundry and other clothes in the house. Sometimes, it’s your body that becomes the target for kneading, especially if you maintain a close relationship with your cat. 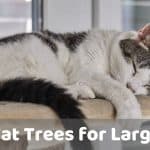 Pet experts recommend that you provide a pillow or any other material that a cat can paw at if its kneading seems too disturbing, like when it keeps doing it on you, or if it does it on things it shouldn’t around the house. It can cause torn sofas in the house or clothes that are not in their places. You can include a pillow in their bedding so that they don’t knead at the things you don’t want them to. While kneading is harmless and even of benefit to a cat’s life, too much of it can be bad. It can be too frequent and compulsive that your cat kneads at anything. At times, the cat may even try to suckle from objects or other pets when pawing at them. An obsession with pawing can be a problem and could disrupt your cat’s life. It can cause harm and damage to the house when the cat uses its sharp claws to scratch on things, or when it scratches you while kneading. And, if it does it often, it can be monotonous and annoying. If you notice any of the signs, it may be advisable to stop the obsession right away. Try to look for distractions like toys and give them to your cat to play with. Or, you can give it food to take its mind off of the kneading. Another way to distract your cat from kneading too much is by making her lie down with its belly facing upwards and coaxing it to drift off to sleep. Alternatively, you can cover its paws with your hands, playfully, and make the kneading difficult. The cat will probably forget the pawing and look for a different activity to do, or simply lie down to rest. If kneading from your cat hurts, you can make it less painful by carefully clipping the claws, or you can direct them to a soft surface such as a pillow whenever the cat tries to paw at you. It will avoid them hurting your body. If you can’t trim the claws, a better option would be to find covers for the claws, which you can easily obtain from a pet store. When trimming your cat’s claws, avoid using the temptation to use the clipper designed for humans; it isn’t made for feline claws. Purchase a pet claw trimmer instead. You may, at times, not like it when your cat constantly kneads you after developing great affection for you. You may understand why do cats knead, but you want kitty to stop kneading on you. While you may be tempted to drive it away by yelling at it or shoving it off your body, it’s not recommended. Try to be as human and gentle as you can be. Your pet cat is not to blame; it’s only being loving and looking up to you as its mother. Get one of your old clothes that you wore not long ago. Such clothes will have your smell, and your cat will not reject it. Use it to distract your cat whenever it starts to knead you. You can do this by placing it underneath paws of your cat when it starts to paw at you. Once it clutches the cloth, move the cat away from you together with the cloth. The cat might keep returning to you every time you move it away, but don’t give up. With time, it will learn to play with the cloth and leave you alone. To encourage the cat to knead the cloth and not you, place the cloth near you when the cat is around and have it pick on it. Don’t worry if it chooses you over the cloth; just continue training it until it finally understands. Toys are fun for the cat and can command its full attention. Have a toy near you that you can direct the cat too if it starts to knead at you. Over time, it will learn to play with the toy when you’re around and not you. This training may take quite some time, so you need to be patient. And, if your pet cat is too naughty to be distracted by the toy, you can always use other gentle ways to distract kitty. Kneading in a cat is natural and harmless. It helps the cat to feel comfortable, safe and relaxed. It’s a behavior they learn at the age of suckling when they use it to stimulate the production of milk from the mother. While some cats outgrow this behavior, most of them don’t. They, therefore, find it highly rewarding, the same way it used to feel when the cat was a little kitten. Some cats will experience a compulsive tendency to knead. In such extreme cases, you would need to tame the behavior, but reasonably. Taming involves the use of distractions such as toys. A cat with sharp claws and one that’s used to kneading at humans may hurt, and trimming its claws becomes necessary. Pet experts take kneading in cats to be beneficial to them, and, if moderate, shouldn’t be discouraged. I hope this article answers your question of why do cats knead. PreviousWhy Does My Cat Sleep With Me?